Dustin Howard serves as the File Clerk. He graduated with an Associate in General Studies from Central Texas College in 2011. He is taking classes to earn a Bachelor's degree in mathematics. 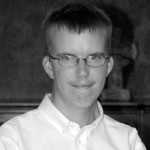 Dustin is responsible for electronic organization and record keeping, as well as other clerical functions. He enjoys playing guitar, software and game programing, and studying baseball statistics for fun. ©2019 The Personal Wealth Coach®. All Rights Reserved. Providing investment advice, products and service to investors in Central Texas since 1982. ​800-914-7526/254-947-1111. Please contact your tax and/or legal advisor for tax or legal information. Past Performance is no guarantee of future returns and investments may be priced higher or lower when sold than when bought. Information herein has been obtained from sources deemed reliable but no guarantee or warrantee of accurateness of completeness is made or implied. This is not an offer or solicitation to buy or sell any security.